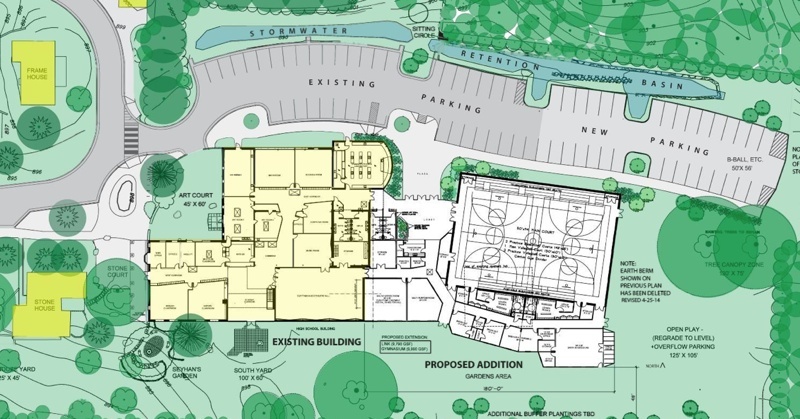 An expansion of the Rudolf Steiner High School took a step forward with Ann Arbor planning commissioners recommending approval of a site plan at their June 3, 2014 meeting. The private school is located at 2230 Pontiac Trail, north of Brookside. The project – estimated to cost $2.5 million – involves building a one-story, 19,780-square-foot addition to the existing classroom building. The building will include a 9,990-square-foot gym, with the remaining 9,790 square feet used for classrooms and storage. According to the staff memo, an existing Quonset hut on the east side of the site will be removed, as will a 48-inch white oak tree immediately east of the proposed addition. The school will be required to plant 12 trees for mitigation. In addition, 17 new trees will be planted as part of the project. Parking will be increased by 31 spaces to accommodate special events and discourage parking in nearby neighborhoods, according to the staff memo. A total of 32 bicycle parking spaces will be provided near the north entry to the new addition. No additional enrollment beyond the previously approved 120 students is proposed. The school has operated at that location since 2002. 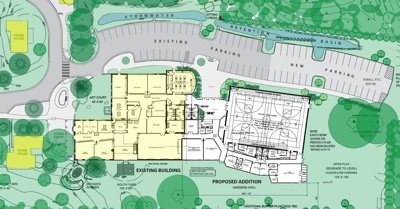 Site plan for Rudolf Steiner High School expansion. The yellow section is the existing building. The white section indicates the proposed addition. The site plan recommendation will be forwarded to the city council. In a separate vote, commissioners approved a special exception use for the project. That’s required under Chapter 55 of the city’s zoning code because the site is zoned R1D (single family dwelling). Private schools are allowed within that zoning district, if granted a special exception use. The planning commission has discretion to grant a special exception use, which does not require additional city council approval.